Talk about curb appeal — and needing some. This 1905 bungalow in Atlanta had been neglected for so long that it was dragging the whole Grant Park neighborhood down with its droopy awnings and vinyl siding. So Carl Mattison and Rob Smith, who live in the area, decided to do something about it. It had sustained a lot of water damage over the years. The awning dated back to the 1930s and had been painted over many times, so they removed it. It instantly made the front porch look more open — and a lot friendlier. “It’s now a place where you talk to neighbors, visit and wave,” Mattison says. They removed the vinyl siding that had been covering the original wood clapboard since the 1980s and were able to salvage the original beadboard that was hiding underneath layers on the ceiling. The front door is from a salvage yard and cost about $150 to patch and paint it (Sherwin-Williams “Hazel“). The bathroom was unusable. The kitchen didn’t have any working appliances. The original hardwood floors had been painted over or covered with linoleum, and 1970s wood paneling covered the original plaster and lath walls. Mattison and Smith thought it deserved better. After scooping up the home for $175,000, they shelled out another $205,000 to beautifully restore it, transforming a neighborhood eyesore into one of the jewels of the street. Read the article by Mitchell Parker for more information and to see more photos taken by Josh Vick. And check Carl Mattison Design to see more of his work! Julia – I’m impressed that you identified this as a Queen Anne. The bungalow form and simple detailing are unusual for the style and would lead most people away from calling it Queen Anne. 1095 was at the very end of the Queen Anne period, and the very beginning of Craftsman. An interesting example of a transitional home! That you call it a Queen Anne bungalow is a little bewildering to me, I’d like to know why it would be classified as such. I live in a very similar home, 1901 in Illinois but the details and style are almost exact. One and a half story, low porch, beadboard, interior and exterior doors all original to mine!, but for a different layout, this could be my house. I’ve had difficulty classifying mine as anything specific, because it seems so in between periods. Its been referred to by so many people as so many different things, I’d love to know if Queen Anne Bungalow is a term I could be using? Thanks for any input! Thanks! I looked at a few pictures and they are very similar, obviously, the same style. The article helped, too, as the reason I never thought of my house as a bungalow was that I see a Chicago brick bungalow when I think of them, craftsman effects and all. My definition of ‘bungalow’ was faulted. My neighborhood is full of larger, fancier all out Queen Annes, they are lovely but the single story fits our family life better. Now I know what to refer to my home as, not just, ‘uhm, whatever it seems to be.’ Thanks!! I admire their color choices. What a happy ending for this cute house! I love it! I’m always impressed when people are willing to take on a project this massive. I am, too, Erin. I think I would’ve felt overwhelmed by a project like this one! Stunning! Absolutely beautiful. I checked out the additional pictures on Houzz – everything is perfect, and I’m impressed with their attention to detail. Great job to them! I wonder how much they sold it for? I remember seeing this one, about a few months ago maybe. I was very impressed then, and I’m still really enjoying the images. A few things you didn’t mention: the porch ceiling, if you look at the distance between the window and the ceiling in the before picture, and then in the after, you can see they took out several inches of material that was applied one on top of the other. Also note the entry way, somebody put a WALL right in front of the front door (seen in the before pics after they tore it down!). They literally peeled back all the layers of the different styles from over the years, since everything seemed to have been installed on top of the old stuff. Even though I’m not a big grey fan, I think there is just enough color there to make me happy. Especially the new porch ceiling, it would have never occurred to me to pick that color, but it is beautiful! The interior floors are to die for!!!!! I am loving this restoration, even though it has a fairly distinct 2010’s stamp on it with the colors and patterns, but that is easy enough to update later on. Thanks for pointing out some of the additional project details, Aubry. And I agree, love that they restored those old floors! They seem to have added a lot to the second story. Or just added a second story all together. It looks like a pretty cool home. Yes, I believe they added dormers to make the upstairs space more usable, which was smart! I found where I first saw this house, on houzz. There are more pictures of the inside (kitchen, bathrooms) and it shows the addition done on the backside. There is nothing that I don’t adore about this house!! Just warms my heart to see these transformations. Nothing better than a refurbished bungalow with a great covered porch. It would have been so easy to scrape and start over – cheaper too. But this is now a coveted home that will last another 100 years. I like to think I would have the vision to do that but wow, I am not sure. That is incredible and I would live there in a heart beat. I can’t think of one thing I would change about it! Gorgeous! I love seeing these Grant Park dames brought back to life. I absolutely love everything about this bungalow – I could move right in! Grant Park is such a beautiful area of Atlanta, it’s great to see this home added to the dozens that have been renovated in the past 5 years. The sunburst address signs also help the neighborhood association restore old homes and sponsor non-profits and schools. Almost all homes in the neighborhood have the sunburst, which just goes to show you how much the residents of Grant Park take pride in their community. Well thank you Julia for seeing this home and posting about it. It was a joy to redo. The lastest house reno is up on my houzz.com profile for anyone wanting to see that transformation. Same neighborhood in Atlanta. We called it “Hill Street Hacienda”. Such fun doing these and bringing them back to life and new neighbors in. Thanks for all the nice comments everyone! glad ya like what i (or we) do. Love that house. Wow. The porches, the front door! I am always so happy to see when people lovingly restore a home with mind to the history and character it was designed with. Fabulous! Nice remodel, but I don’t think it’s Queen Ann style, perhaps a transition between Queen Ann and Prairie style. Thanks everyone for the wonderful comments. And thanks, Julia, for the awesome article! For more before, progress and after pics — including floor plans — be sure to check out http://www.598oakland.com. For out latest project in the same neighborhood, check out Carl’s Houzz profile or visit http://www.675hill.com. And oh yes… someone asked what we sold this house for… the sales price was $550,000, and we sold it on 3/14/14. This restoration is so amazing I can’t stop looking at the before and after pictures. 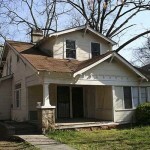 It makes me so happy to see or hear about these neglected homes getting saved. Best before and after ever. What a little diamond in the rough! I appreciate and envy their vision and that they did not see this house as a tear down. I bet the neighbors were giddy with the end result. Bravo! Fantastic renovation! I might have the vision to do this, but definitely not the energy! It looks absolutely beautiful now, and I love their community spirit. as soon as i saw Grant Park i couldn’t wait to see this reno….my husband grew up in grant park and the “before” looks a lot like his grandparents old home….of course it’s been years and years since he lived there but last time we drove thru there the house looked terrible….it’s wonderful how these homes are being restored and this one knocked it out of the park! thanks for sharing julia! I just worked on a similar Craftsman restoration where aluminum siding hid the shingles, black painted stucco covered the brick and screens painted black enclosed the porch. One wonders about the previous homeowners that created the mess. In my case as in this case it is refreshing to see homeowners that care and understand the character of old homes. I’m sure the neighbors are pleased that this restoration will increase their home values. Well done! Funny, the first thing I saw was that funny little sign with the house number on it and it was the first thing mentioned in your article AND; the only thing that looks out of place! Julia – they did a spectacular job on this place!!! I love all the details, particularly the updated front porch with the breadboard ceiling and fabulous front door. Thanks so much for sharing such an inspiring project! BEAUTIFUL! I so love people with vision. I have none.